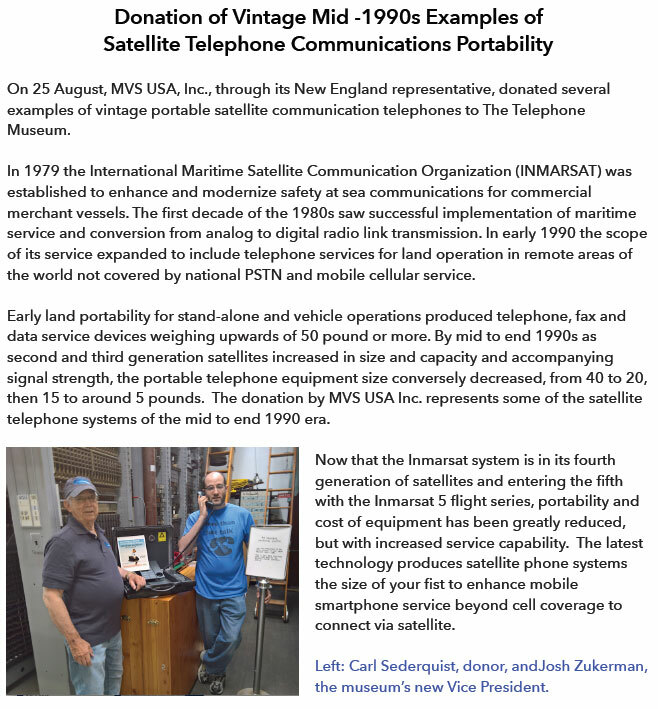 "The Pole Line" - The Telephone Museum is operated by The New England Museum of Telephony, Inc.
A PUBLICATION OF THE NEW ENGLAND MUSEUM OF TELEPHONY, INC.
and receive periodic editions of “The Pole Line” the newsletter of The Telephone Museum. Please click on JOIN & SUPPORT to start your membership today! FROM TIME TO TIME we will publish selected articles from the newsletter archives. We hope you will enjoy reading these and look forward to your comments. HONEY, I EXPLODED THE PHONE! This past June, The Telephone Museum in Ellsworth, Maine held the grand opening of its largest event to date. The exhibit, titled The First Hackers: Phone Phreaks vs. Ma Bell, is located in the new Visitors Center. Inspired in part by the Phil Lapsley book Exploding the Phone, The First Hackers shows how the first phone hackers learned the secret inner-workings of the mysterious telephone network and how to manipulate control of it to their own ends. A number of interactive stations in the exhibit are equipped so visitors can try their hand at “dialing” calls by “blowing” 2600Hz and/or “blue boxing” calls. Also part of the phreaking experience are stations for the loop around in the #5 Crossbar switch where callers can connect with another visitor or lurk and see who else calls in including from C*NET! In addition to numerous items from the museum’s own collection a number of items were donated and/or are on loan from personal collections to make this exhibit possible, including blue boxes, red boxes, flutes, whistles, magazines — even evidence photos from the era. The looks on the faces of all of the guests and visitors made all the time, effort and funds into producing the exhibit worthwhile. Due to positive feedback we’ve decided to extend the exhibit through next season – but we need your help. This exhibit strikes at the core of our Mission, but the museum will need the support of all volunteers and donors to execute and fund the ambitious plan to extend this exhibit and simultaneously try and save the Barn (see related article). Please give generously. If you haven’t received an appeal, or to learn more about how you can help support continuing the exhibit, the museum and save the Barn, contact any Director or e-mail us at switchboard@nemot.org. The Trustees of Reservations in Massachusetts conserves nearly 25,000 acres of land and more than 100 “special places” throughout the state. From Appleton Farms, a working farmstead in Ipswich, to the homestead of poet William Cullen Bryant in Stockbridge, these exceptional properties are preserved for public use and enjoyment. For telephone switching enthusiasts, the Great House at Castle Hill on the Crane Estate in Ipswich is perhaps the most special of these places. The house, as it stands today, was built in 1928 by Chicago industrialist Richard T. Crane, Jr. It is a Stuart-style mansion of 59 rooms surrounded by landscaped grounds featuring one-half mile of manicured lawn flanked by statuary known as the Grand Allee, and 21 outbuildings including a casino and a powerhouse. 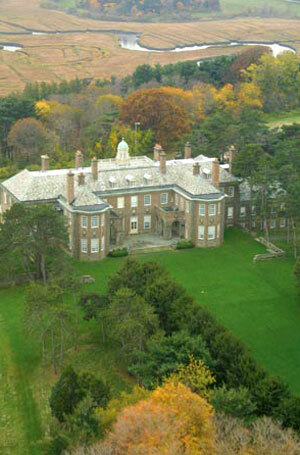 The Crane Estate consists of 2,100 acres on the Massachusetts coast. The Great House is open for tours from May 27 to October 9 and for special events throughout the year. Last fall, one of these special events drew the attention of Sandra Galley, vice-president of The Telephone Museum in Ellsworth, Maine. It was called “Hot and Cold Tours: Behind the Scenes of the Great House” and was publicized as a cellar-to-rooftop tour of the spaces that kept the household running smoothly by means of early 20th century technologies. Surely a bank of Strowger switches lurked somewhere! Almon B. Strowger (1839-1902) was the inventor of a mechanism that made the rotary dial phone possible, eliminating the need for (manual) switchboard operators. With his 1891 patent in hand, he founded the Automatic Electric Company, selling his product to independent telephone companies. When the Bell System acquired the patent in 1916, the switch was renamed “Step-by-Step” which refers to the horizontal and vertical stepping motion of the device. 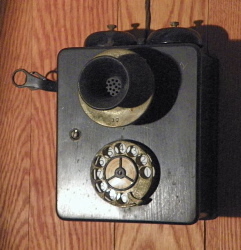 The switch, by whatever name, served the telephone companies for more than 100 years. Sandra inquired as to whether the telephone system was included in the tour, and was informed that it was not because little was known about it. Linda Marshall, the Trustees’ Cultural Site Administrator/Ipswich Historic Houses, then invited representatives of The Telephone Museum to examine and report on the switch, with the intention of training volunteers to interpret this essential part of Great House operations. On December 7, 2011, Charles and Sandra Galley, John McNamara, and museum president Charlie Dunne met Linda and Susan Hill Dolan, Cultural Resources Manager for the Crane Estate, in the cellar of the Great House. The Telephone Museum folks were thrilled to find an almost pristine Automatic Electric Private Automatic Exchange in a glass cabinet in a small anteroom at the bottom of the stairs from the Great House kitchen. It shows no signs of damage from water, fire or abuse; unfortunately, it lacks a power supply. A motor-generator set would have provided 48 volts DC power to the telephone system and would have run off of the house electrical system. In addition, much of the wiring in the house has been cut or re-purposed for doorbells, conventional telephone service, etc. In spite of these drawbacks, Charlie Dunne surmised that adding a small, 48-volt rectifier, and applying a little cleaning oil, could bring the switches back to working condition. There are some recessed mount AE telephone sets still in place. Desk sets may still exist in the bedrooms or elsewhere. There is a single, multi-pair outside cable that goes through the front foundation wall to feed many of the outbuildings. This is a lead-sheathed cable with plastic, or perhaps rubber-over-silk insulation. The plastic (or rubber) is brittle and breaking; and considering the amount of utility work that’s been done over the years, is likely chopped off somewhere. Linda and Susan enthusiastically led The Telephone Museum representatives deeper into the cellar to admire other parts of the electrical system (both AC and DC), the plumbing and boilers, and upstairs to view the elevator, servants’ quarters and kitchen. The lateness of the hour prevented further exploration, but the interest was keen! The Telephone Museum representatives are eager to restore the switching system for educational purposes, if the Trustees decide to proceed. John McNamara offered the use of a gadget to “debug” the system, and Sandra Galley offered to introduce docents to this piece of telephone history – Charlie Dunne offered to move in! If the system were restored, docents could call from one room to the next and visitors could watch and hear the switches operate as these calls were being placed. In the “real world” digital switching systems long ago replaced the electro-mechanical systems that are preserved by and demonstrated at The Telephone Museum as part of its mission. Restoring the Great House switches would offer an unusual, and amusing, glimpse into mid-20th century communications and add a new dimension to the “Hot and Cold” tours.